Due to redistricting I now live in District 11 which has been represented by Linda Koop for several years now. Koop is well known to cycling advocates for her work in transportation and support for a better cycling infrastructure. Note that District 11 is home to the Preston Ridge trail, Cottonwood Creek trail, White Rock Creek trail, and Northaven trail. Hike and bike trails matter and District 11 is a shining example of what can happen when a community works together in this respect. Koop’s term expires next month and voters in District 11 will be choosing between Lee Kleinman and Ori Raphael. Both are business guys. Raphael is a former Pete Sessions staffer, yes that Pete Sessions. Kleinman has been knee deep in local politics for years. This is an easy choice for me: Lee Kleinman gets my vote and endorsement. I met Lee for coffee a few years ago. I had some concerns about some of the trail construction in what was then District 12. As a member of the park board I thought he would be a good person to get to know. He was very helpful and I was impressed with his dedication and commitment to our hike and bike trail system and Dallas as a whole. He’s a good person to know and has made numerous contributions to our city as a citizen and also member of many volunteer boards. He can be spotted now and then riding a tandem bicycle around town with his wife, Lisa. Kleinman suggested Raphael was stuck in a “Detroit mentality” meaning drive there now. Raphael was quick to accuse Kleinman of being the candidate who’s “using my tax dollars to pay for bike trails”. Imagine that: a city using bond and county/federal grant money to fund hike and bike trails. I mean practically everyone knows bike trails are a gateway drug. Today it’s bike trails, tomorrow it’s city parks, and later still: county nature preserves! Who will stop this madness? For those new to Dallas politics, a bond fund must be approved by the voters, and sometime voters approve of projects that not every single voter is thrilled about. That’s what we call democracy. Old Abe had it right when he said you can’t please all of the people all of the time. Color me crazy but I don’t think the Tea Party mentality of “it’s all about me and my tax dollars” will serve this district or the City of Dallas very well. In closing I’m looking forward to voting for Lee Kleinman and I think he’ll do an exceptional job for District 11 and Dallas as a whole. 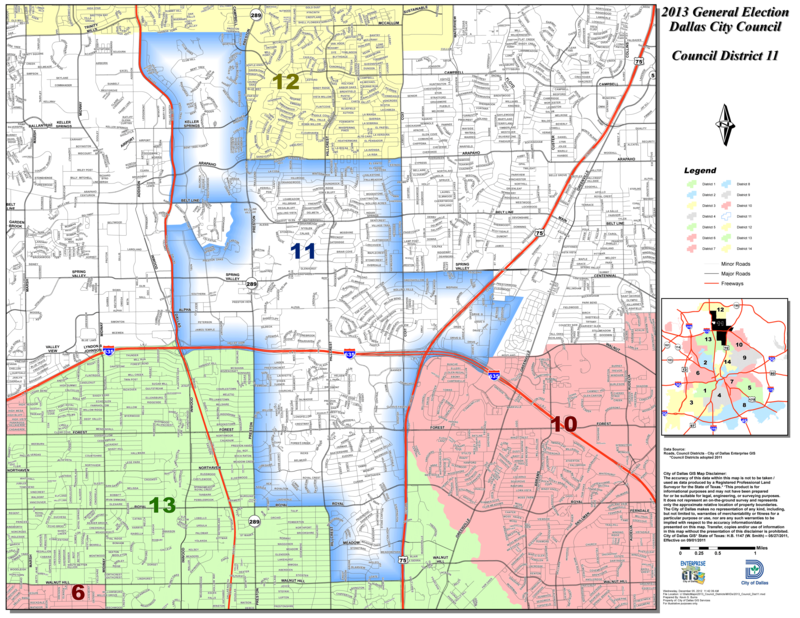 If you live in the far north Dallas area be sure to look at the latestdistrict 11 map. I was previously in district 12 and now I’m in 11, you could be too. I encourage you to visit both candidate’s web sites and learn more about where they stand on numerous issues and then make an informed decision. I did. Chris started riding a bike again when he noticed the Preston Ridge Trail being constructed across the street from his house. Since then he co-founded Biking in Dallas, has gone through countless Craigslist bike projects (some better than others) and can be found pedaling around town on a Electra Ticino with a camera in tow.